A large sunspot emerging is crackling with C-class solar flares and, based on its size, could be capable of even stronger eruptions. So far the sunspot is relatively quiet, producing only a smattering of low-level C-class solar flares. 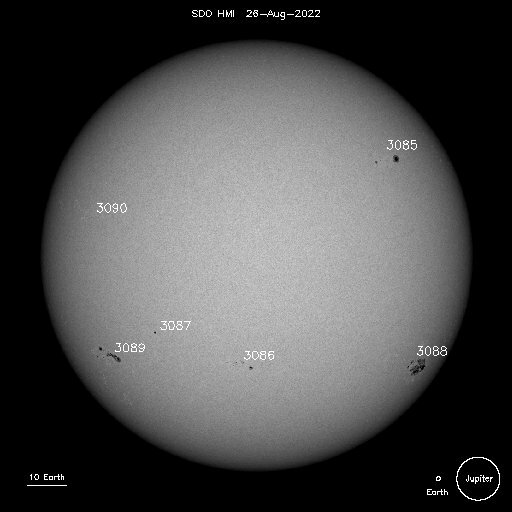 We will know more about AR1654's flare-producing potential in the days ahead as the sunspot turns toward Earth. If there are a lot of sunspots, the magnetic field is most stressed, and the Sun is at its most active. The magnetic flux may get so stressed that it may "reconnect" with opposite polarities, releasing huge amounts of energy as flares. Coronal mass ejections may be unleashed from these flare events, sending hot solar plasma into space. If directed at the Earth, these CMEs can cause damage to satellites, astronauts, even whole power grids on the ground.